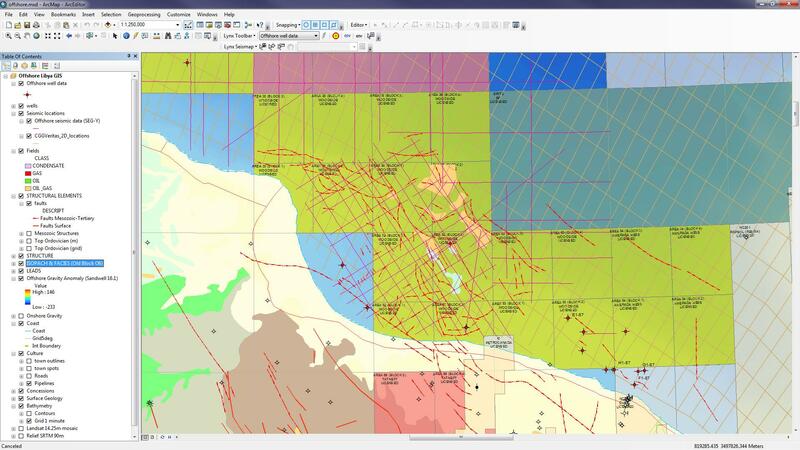 Geographical Information Systems (GIS) is widely accepted in petroleum exploration as a mechanism for integrating data from the various specialisms involved. Because GIS is spatially based, it is a natural working environment for the Explorationist. It gives the user the opportunity to integrate a wide variety of different data and, importantly, allows non-specialists to perform sophisticated queries from associated databases. Also, a GIS project is dynamic in the sense that all of the thematic data and data tables can be edited and new data can easily be integrated. 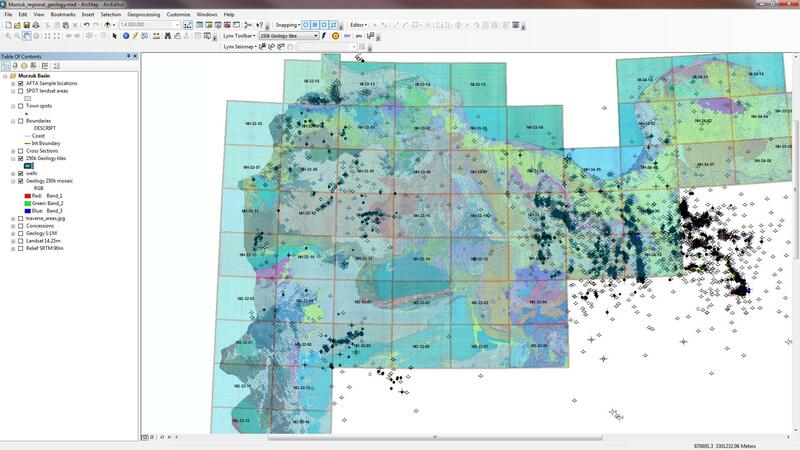 Lynx uses ESRI ArcGIS - the leading GIS software solution for the petroleum exploration industry. We are a member of ESRI's Partner Network for Solutions and Services. In addition we develop our own software to complement and enhance the ESRI ArcGIS Desktop software by offering additional functionality of special interest to explorationists. The Lynx Resource Portal is a comprehensive modular solution for the archive, management and visualisation of seismic, well and licence data. Built on the industry-standard platforms of Oracle Database and ESRI ArcGIS Server, the Lynx Resource Portal provides a robust and extensible system for handling data types. The framework provides an intuitive map-based front-end for the display of your data (including live seismic and wireline log displays) as well as a robust back-end database schema and administration utilities. The Lynx Resource Portal can be customised to fit with your existing hardware and database architecture. For more details on the Lynx Resource Portal, please see here. Lynx mapping services can be provided on a map-by-map basis, or as a part of our comprehensive seismic reconciliation service and GIS spatial database consultancy. We can provide fast and accurate digitising of structural/contour maps with full attribution, seismic shotpoint basemaps and culture maps. We can also convert a wide range of specialist mapping formats to industry standards, including IHS Kingdom, Landmark Z-MAP Plus, Geographix and PetroSys. Additionally, we provide a scanning and georectification service for maps using our full-scale A0-sized (40-inch/1m) colour scanners. 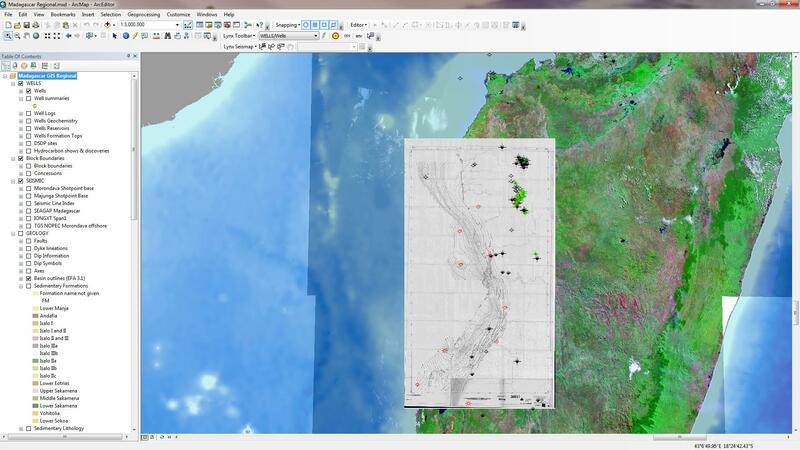 Scanned and georeferenced map displayed in its true geographic position in the Morondava Basin, Madagascar. A GIS database displayed in ESRI ArcMap provides a rich environment for querying and analysing your data, as well as a comprehensive method of creating presentation-quality maps. GIS is a powerful toolset for browsing and querying your data, and for sharing data between members of a multi-disciplinary team. As well as the spatial perspective, which you can vary from global to local, you can perform sophisticated spatial queries, and mine-down into your data to discover new relationships. Lynx can advise you on building and maintaining these spatial databases. We can also create geodatabases using your own in-house data libraries, or based on our existing non-proprietry regional GIS data. We can integrate with existing Oracle® databases, or create an ArcSDE geodatabase. We can provide either a desktop-based solution using ArcGIS Desktop, or a browser-based solution using ArcGIS Server Internet Map Services - see the UKOGL website for an example of a GIS database and web front-end built and maintained by Lynx. Your complete library of data can then be browsed and searched via a map-based front-end, incorporating links to documents (Adobe PDF, Microsoft Word/Excel, etc) and internet/intranet hyperlinks, plus links to national E&P repositories such as the Norwegian Diskos database and the UK CDA/DEAL. Scanned and georeferenced maps tiled together to provide a hyperlinked tiled overlay of geology in Libya. Lynx can provide training courses for explorationists covering our GIS implementations. These courses are usually presented on-site, and can be customised to cover the exact requirements of the client. We provide comprehensive hands-on instruction in both conceptual and practical aspects of ArcGIS Desktop. Please see the Lynx Blog for up to date information topics covered and intended audiences for our current GIS training offerings. Contact us to find out more about how we can help with your GIS requirements.